We have created a new blog (just what the world needed?) specifically for the PL/SQL Challenge. The developers playing the daily quiz are very engaged, to say the least, and they often have lots to say about the questions and answers. When a player has an objection to a quiz, we will now publish an entry about it, so that everyone can comment and read the threads. In fact, Finn published some very interesting results from his research into UTL_FILE and its handling of newline characters. I encourage you take a look. I also wanted a soapbox from which I could talk about why I created the PL/SQL Challenge and where I plan to take it into the future. "The Oracle Development Tools User Group (ODTUG) is pleased to announce that Lee Rainie, Director of the Pew Research Center s Internet & American Life Project, will deliver the Keynote Address at ODTUG Kaleidoscope 2010 on Monday, June 28. The Pew Internet & American Life Project is a non-profit, non-partisan "fact tank" that studies the social impact of the Internet. The Project has issued more than 200 reports based on its surveys that examine online activities and the Internet's role of the Internet in our lives. "Lee is a co-author of Up for Grabs, Hopes and Fears, and Ubiquity, Mobility, Security, a series of books about the future of the Internet, published by Cambria Press and based on Project surveys. He is also co-authoring a book for MIT Press about the social impact of technology, with sociologist Barry Wellman, which will be published in late 2010. The working title is Networked: The New Social Network Operating System. Click here for more information on Lee Rainie and the prestigious Pew Research Center's Internet & American Life Project. "This very timely Keynote Address is just one more reason for attending ODTUG Kaleidoscope 2010, June 27- July 1 at the Marriott Wardman Park Hotel in Washington, D.C. Do not delay in Registering. Also, the hotel is filling up quickly, so make your overnight reservations as soon as possible. The cut-off for the conference rate is June 9. We cannot guarantee that the conference rate will be available after that date." PL/SQL Challenge not useful if you're not on Oracle11g? "I don't have 11g installed on my home computers, and my workplace hasn't upgraded to it (not until 2011). So not having had a chance to use it or any reason to study the documentation, I'm not going to answer any 11g questions. I'd like to recommend the PL/SQL Challenge to people where I work. My principal professional focus, however, is improving the general SQL and programming (PL/SQL) skills of developers, rather than improving folks understanding of the esoterica of PL/SQL. While I personally do appreciate the PL/SQL challenge (especially in regards to the frustrating quirks of the language), I cannot at this time recommend it for a general audience in the industry I work (Financial Services)." I will remove your user account from the PL/SQL Challenge, but please read my response below first and then confirm that you want nothing further to do with it. I can certainly understand your frustration at being confronted with an 11g question, which generally would seem to be completely irrelevant to what you are doing. First, allow me to point out that the vast majority of our questions are based on a 10.2 platform; it would surely be hasty to reject the Challenge as a whole because of this question's 11g dependency. Second, oddly enough, this question is a great example of why the PL/SQL Challenge could be so important for developers who are precisely in your position: not yet on 11g, but surely you know it is coming your way (and for your industry). The function result cache is an incredibly powerful and important 11g feature; it is definitely not "esoterica." In fact (1), it is so powerful and important that once you learn about it, it should change the way you write your applications right now, in order to be prepared to take smooth and rapid advantage of it when you upgrade. In fact (2), I have been presenting for over a year now a presentation titled " Why you should care about Oracle 11g now" (available here) to drive home precisely this point. Bottom line: I hope you will reconsider, continue playing and encourage others to do so. And for everyone else: the Challenge is now being played regularly by over 700 developers each day. I hope that you will give it a try yourself. You could learn an awful lot about PL/SQL and you could win some excellent prizes! PL/SQL Challenge Hits 800 Players! Oracle ACE Director Steven Feuerstein has started up a new contest for PL/SQL Developers: the PL/SQL Challenge. The Challenge is free and simple: you play the quiz each weekday, exercising your knowledge of the language. Every three months, the top-ranking players compete in a quarterly championship to award first, second and third prizes. But that's not all: Every month, Steven will raffle off other prizes to anyone who played the quiz that month. So visit the PL/SQL Challenge and start playing. You've got nothing to lose and lots to gain! Well....that worked out very nicely. Over 300 people registered at the PL/SQL Challenge and today we broke through the 800 player "barrier". Very exciting! Come Monday, players will also see many enhancements to the website, including improved rankings information and the ability to invite friends to play the PL/SQL Challenge. "I love the PL/SQL Challenge. It is getting our team talking about PL/SQL on a daily basis." "I wait eagerly every morning for the next question. It's become a part of my warm-up ritual at work, in addition to making tea." I have just come back from a wonderful weekend in Danville, Virginia, home of Averett University. 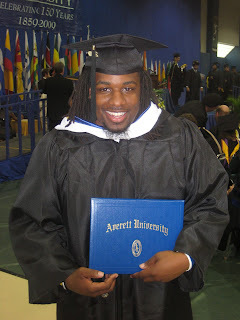 My wife, Veva, organized a family reunion/graduation celebration there, because our nephew, Brian Daniels, graduated from Averett on Saturday with a Bachelors of Science. Congratulations, Brian! Brian is the first member of his family to attend, much less, graduate, from college. He made this possible through dedication, discipline, hard work (hard, hard work) and a quiet strength that kept him going through many obstacles. And, of course, the unswerving support of his family. Brian attended Averett on a football scholarship and I hope to soon announce the next step in his incredible journey regarding Brian and the game (or should we say "business") of football. After the graduation ceremony, we held a party for Brian at Mary's Diner that was very tasty, exciting and moving. Many friends and relatives spoke of their pride in his accomplishments, and the traits that have made him both so successful and so loved. Brian is a born leader and a true friend and role model to many. We all look forward to his future accomplishments.